At NIR Roof Care, we always stress the importance of safety in the work place. Being in the roofing industry puts us in harms way every day and creates a higher probability of accidents occurring. However, while we stress to our customers to leave it to the professionals, there are times at home that you may have to clean those gutter, make your way up into the attic or even paint that fading exterior. So, while you may have a tendency to leave it to the pros when at the office, we here at NIR Roof Care want to make sure you are just as safe as we are when your at home. For many folks, buying a ladder for a project seems almost so basic you don’t even need to think about it. Whatever looks tall enough to get you up there should do the trick, right? Wrong. Whether you’re talking stepladder or extension ladder, buying one and using it safely requires a little know-how. Some anticipation of the future projects you might undertake helps in getting the best ladder and the best value. 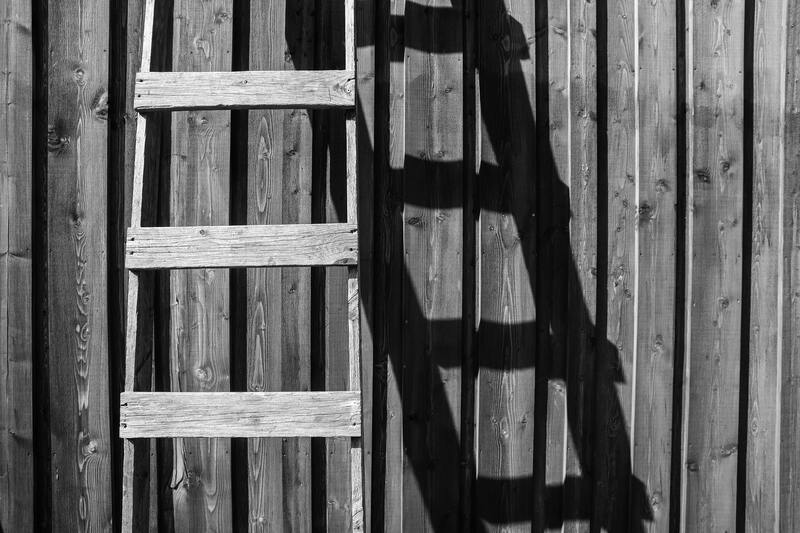 When I’m choosing a ladder, I consider how often I’ll use it, what I’ll use it for, and my two most important criteria: how high I’m going and what the ground or surface that I’m climbing from is like. Properly cared for and used, ladders last a long time. Buying the right one for current” and perhaps future” projects is energy well spent; you’ll hedge your bets against wasting money and taking needless chances with your own safety. Alternatively, if you have no plans to get on the roof, a 24′ ladder will typically get you to the eaves of a two-story house for painting, window repair, and other items along the sidewall. However, it’s not unheard of for folks to misuse ladders when unintended situations arise. “Nah, I’ll never need to go on the roof,” you think” until a hurricane deposits a tree branch there, or blows off shingles so it’s raining in your bedroom. Next thing you know, you’re bouncing up your (undersized) ladder because it’s an emergency. If there’s a scintilla of a chance you’ll go topside, my advice is to buy up. Better to have it and not need it than to need it and not have it. Here are a few of my favorite tips for using extension ladders. This isn’t a complete safety checklist, nor does it cover every situation. For complete information on the situations and ladders you have, check the manufacturer’s safety information. It seems a little counterintuitive, but I find it easiest to carry an extension ladder vertically. I tilt it up from the ground, putting the ladder on its feet. Next, I reach down with one hand to grab the rung below my hip, and up with the other hand to grab the rung above my head, then lift to carry the ladder. Because I’m holding the ladder vertically, when I reach my destination, all I have to do is put the feet down and lean it against the building. Before I go anywhere, however, I map out my route and plan accordingly. While bumping tree branches is frustrating, bumping the electric supply line to the house is terrifying, if not deadly” even if your ladder is fiberglass. There’s a simple science to positioning the ladder against a building at the proper angle for optimum safety. If you can stand with your toes at the ladder feet and reach straight out with your hands to touch the rungs with your fingertips, you’ve got the right angle. If not, adjust until you can. On uneven terrain, you need to block up one of the ladder’s feet so it’s plumb. The wider and more stable the item (think a 2 instead of a brick), the safer you’ll be. 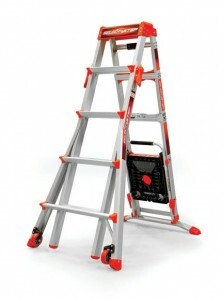 Alternatively, there are several ladder-leveling accessories on the market. Remember that whether the ground is level or not, the ladder rungs need to be level for maximum safety. In wet, muddy terrain, kick the ladder’s feet parallel with the rails and drive them into the mud before angling the ladder against the building. (Sometimes you’ll need to lean the ladder on the building, lift it a little, and roll the feet with your hand.) Some feet have spikes or cleats to help them dig in. When you’re on a ladder, follow the belt-buckle rule: Always keep your buckle between the rails. No matter how temping it is to stretch a few more inches to paint that siding, keeping your buckle between the rails helps keep you balanced and in control. Stepladders are front-line home improvement tools and one of the most misused. A 4′ or 6′ stepladder will get you to the ceiling of an average home for anything from repairing lights to installing crown molding to hanging pictures. They work well as a team, too. For example, a 6′ stepladder is too tall and its leg-spread too wide to fit within a door frame to set casing, while a four-footer isn’t tall enough to reach a 10′ ceiling to hang a ceiling fan. I’ve found that having both helps me all over the house. When buying a stepladder, then, the rule of thumb to keep in mind is that your feet will stay about 2′ below the ladder’s nominal height. For example, a 6′ stepladder gets your feet about 4′ above the ground. Add your own height to that number for a real picture of where the ladder will get you. The danger people usually run into with stepladders is that, despite written warnings, they insist on using the “THIS IS NOT A STEP” rung. 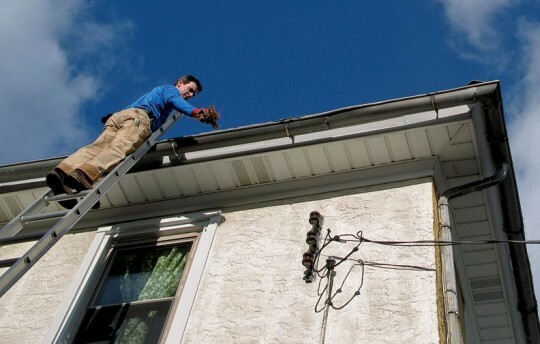 Climbing there to reach porch gutters or trim a branch often results in meeting the ground at a high rate of speed. 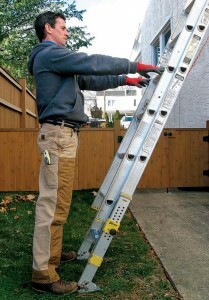 A basic stepladder or extension ladder will usually get you where you need to go. However, because they have fixed legs and/or heights, they have their limits, which has paved the way for articulating ladders and other versatile accessories. For example, the Select Step stepladder (from Little Giant, who pretty much invented articulating ladders) features independently telescoping front and rear legs, which let you work efficiently in all kinds of situations. 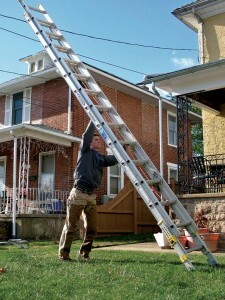 Personally, I use it all over the place leaning the ladder snug against the wall to install a porch light, trimming a tree branch on uneven terrain, or cleaning the second-story gutters above my porch roof, adjusting the legs in each situation so the ladder stands close to how it would in normal use. For a different take on the extension ladder, Extend and Climb has a series of compact, telescoping ladders good for any number of jobs. They get you where you’re going, then retract into a compact, easy-to-carry, easy-to-store package. Reaching the top means using the right ladder the right way. Just about everything you need to know about your ladder is printed on it. Read every label, it will help you set up your ladder and use it properly every time, keeping you safe.While most major manufacturers now make an articulating ladder, sometimes what the doctor ordered is a ladder accessory. Base Mate’s Professional Ladder Stabilizer attaches to your existing extension ladder, enabling you to adjust it easily and safely to accommodate uneven terrain. 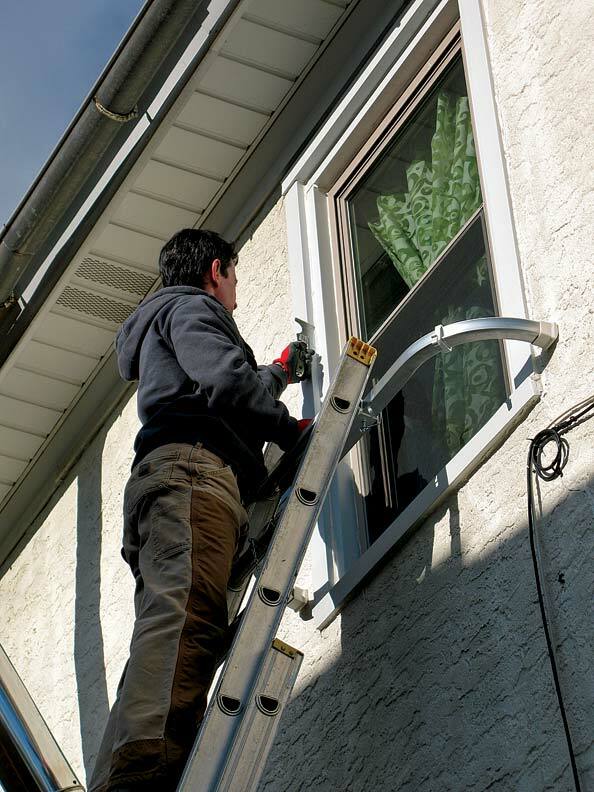 Rubber bumpers and stand-offs like Werner’s QuickClick let you prop an extension ladder more gently or away from the home so you can span a window or keep from crushing gutters.